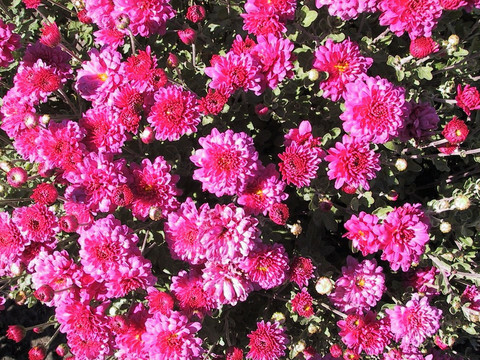 In moderate climates, that is hardiness zones 6 to 9, the most popular fall flower is the garden chrysanthemum, often called cushion mum, fall mum, or garden mum. In colder climates, though, chrysanthemums haven’t shown themselves to be particularly hardy and many gardeners have learned to avoid them. Fortunately there are now extra garden mums to try, ones well adapted to climates as cold as zone 3. How did this change come about? Read on! The garden mum now goes under its old name, Chrysanthemum x morifolium, after having spent a number of years under the name Dendranthema grandiflorum. It is believed to have first been hybridized in China over 1500 years ago and there are literally thousands of cultivars. The main botanical chrysanthemum behind the hybrid is C. indicum, a not very hardy species (zones 7 to 12) from India and China. However, many other species have been used, some of them very hardy (zone 3 or even 2), with the result being that some garden mums are very tender and others very hardy. But until recently, you couldn’t tell which, among the dozens of beautiful specimens sold in the fall in garden centers, were going to act like annuals and die over the winter and which would come back year after year. Developed at the Morden Research Station in Manitoba several decades ago, this series provides compact, densely flowering plants with double flowers, very much the typical cushion mum, only much hardier. They also bloom very early (important in short-season areas), starting in late August, and continue for 8 weeks and more. 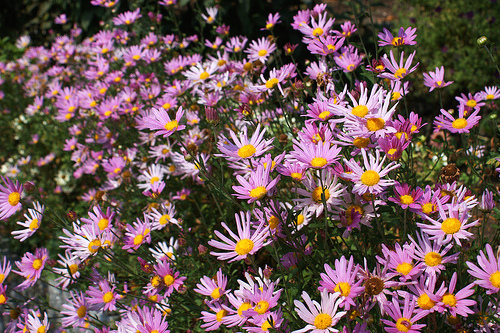 They’re all about the same size (1-1 ½ ft x 1 ½-2 ft/30-45 cm x 45-60 cm) and are hardy to zone 3. The following varieties are the most popular: ‘Morden Cameo’ (creamy white), ‘Morden Canary’ (yellow), ‘Morden Delight’ (orange-red), ‘Morden Fiesta’ (violet-purple) and ‘Morden Garnet’ (dark red). This is another series developed in Manitoba, this time by Jeffries Nurseries, by crossing less-hardy hybrid mums with those of the Morden series. They start blooming in early September and continue for 8 weeks or so. They vary in size and form, but all are hardy to zone 3. Dreamweaver® (‘Jefdream’) has semi-double purple flowers with a yellow center. The outermost petals are trumpet-shaped, giving the flower a very original appearance. 2 ft x 2 ft (60 cm x 60 cm). Firestorm® (‘Jefstorm’) produces semi-double dark red flowers. 1 ft 10 in. x 1 ½-2 ft (55 cm x 45-60 cm). Power Surge® (‘Jefsurge’) has fully red double flowers. It’s a compact plant forming a wide dome. 1 ½ ft x 3 ft 4 inches (45 cm x 100 cm). Showbiz® (‘Jefbiz’) produces an abundance of double purplish pink flowers. 1 ½ ft x 2 ft 6 in (45 cm x 75 cm). Stardust® (‘Jefdust’) has double to semi-double flowers that are described as “dusty mauve”, but to me open a more bronzy orange melding into a deep pink. 20 in x 3 ft (50 cm x 90 cm). 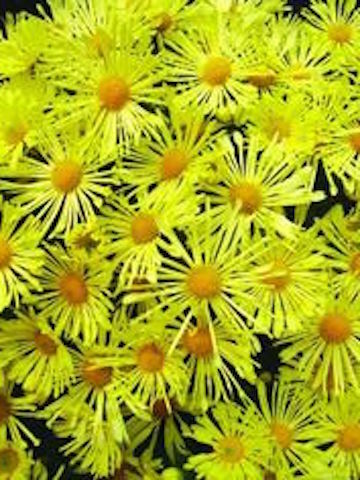 Suncatcher® (‘Jefsun’): bright yellow double flowers. 2 ft 6 in x 4 ft (75 cm x 120 cm). Tigertail® (‘Jeftail’): double orange flowers that become yellow over time. 2 ft 4 in x 3 ft (70 cm x 90 cm). Developed in Minnesota, these plants result from crosses between C. x morifolium hybrids and the very hardy C. weyrichii. This results in tall, almost shrubby plants with single to semi-double flowers, interesting for the middle or even the back of the flowerbed. Do note though that these plants grow slowly, only gaining their final dimensions of about 4 ft x 5 ft (110 cm x 150 cm) in their third year. This series includes the full range of chrysanthemum colors. The Mammoth™ series was originally launched under the name My Favorite and you may still see some of these plants sold under their former name. Mammoth™ ‘Red Daisy’ (formerly My Favorite™ ‘Autumn Red’. ): Semi-double red with a yellow center. Mammoth™ Coral Daisy ‘(formerly My Favorite’ Coral ‘. ): Single coral pink. Mammoth™ ‘White Daisy’ (formerly My Favorite™ ‘White’. ): Semi-double white. Mammoth™ ‘Dark Bronze’ (formerly My Favorite ‘Dark Bronze Daisy’. ): Semi-double orange. Mammoth™ ‘Dark Pink Daisy’ (formerly ‘My Favorite™’ Dark Pink ‘. ): Single deep pink. Mammoth™ ‘Lavender Daisy’: Semi-double lavender pink. Mammoth™ ‘Yellow Quill’: Single pale yellow flowers, with the same dimensions as the other Mammoths, but unusual quill-shaped ray flowers. Despite a name that seems to suggest excellent hardiness, the Igloo series is less hardy than the others mentioned so far, to about USDA zone 5, AgCan zone 6, although they may be worth a try in a protected spot. 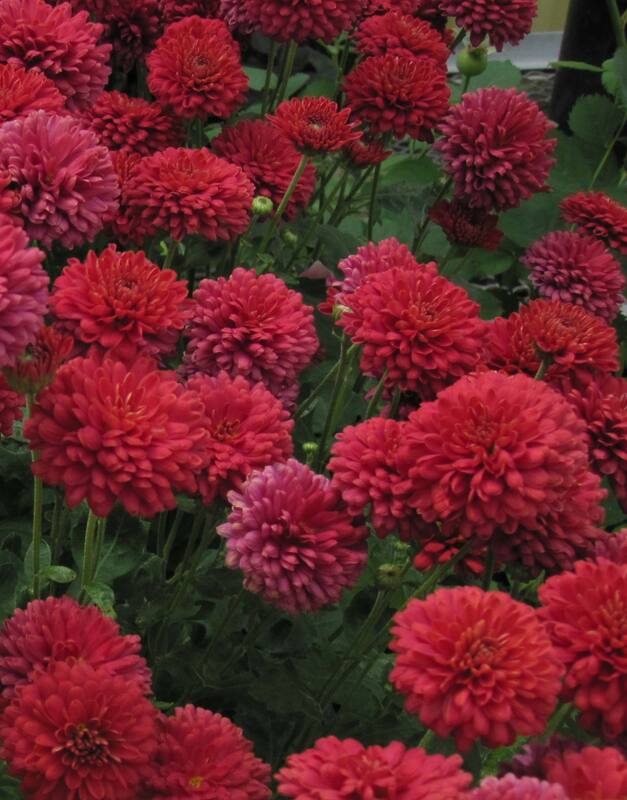 Their double flowers come in the full range of colors and they form the typical dome one expects from a cushion mum. Dimensions: about 2 ft x 2 ft (60 cm x 60 cm). The following hardy C. x morifolium cultivars do not belong to any series. ‘Prairie Lavender’ is compact with lavender pink flowers. The flowers are double, yet you can still see a bit of the yellow center. 2 ft x 2 ft (60 cm x 60 cm). Very hardy (zone 3). ‘Matchsticks’ is less hardy than most other “hardy” mums (USDA zone 4b, AgCan zone 5b), but may be well worth trying because of its very unusual flowers: the rayflowers are yellow-orange and tubular at the base, opening into broader red tips, creating a beautiful contrast. 1 ½-2 ft x 2 ft (45-60 cm x 45-60 cm). 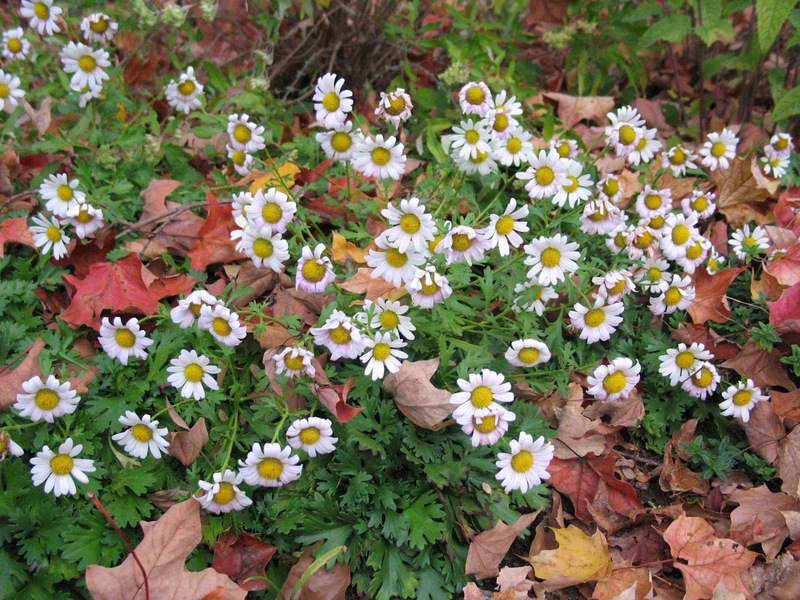 The genus Chrysanthemum was split apart many decades ago into other genera, including Glebionis (annual species), Leucanthemum (typical white daisies), Tanacetum (painted daisies) and others. Among the various chrysanthemum offshoots, the following plants are fall-blooming and still considered “mums” by gardeners everywhere. Weyrich Chrysanthemum (C. weyrichii): this is a dwarf species from the very cold Kamchatka Peninsula. It’s a spreading groundcover with low-growing incised leaves that burst into bloom late in the fall, often November. The daisylike flowers can be white (‘White Bomb’ is the usual cultivar) or pink (‘Pink Bomb’). The whole plant is rarely more than 6 to 8 in (15-25 cm) high, but can form carpets 2 or 3 feet (60-90 cm) wide or larger. Arctic Chrysanthemum (Arctanthemum arcticum, syn. C. arcticum): This one is much like the plant above. The species has white flowers, but the most commonly grown cultivar, ‘Red Chimo’, has pink flowers. The arctic mum reaches only 6 to 12 inches (15-30 cm) in height, but forms a compact mat about 12 to 18 in (30-45 cm) diameter. It blooms in early September. Zone 3. Rubellum Mum (C. x rubellum, formerly Dendranthema zawadskii latilobum): As called hardy mum, heritage mum and old-fashioned mum, this has long been the most popular chrysanthemum in cold climates due to its tough-as-nails habit: they don’t call it the hardy mum for nothing! Its background remains mysterious (taxonomists keep changing its botanical name), but that doesn’t stop it from being an easy-to-grow garden mum, well adapted to zones 3 to 8. It has deeply cut, mid-green leaves, a rather open habit (it is anything but a “cushion mum”) and single daisylike flowers. It’s also a bit of a spreader, thanks to creeping rhizomes, and can be floppy if you grow it in other than full sun. By far the most popular cultivar is ‘Clara Curtis’, with pink flowers, but you will also find ‘Mary Stoker’ (apricot yellow), ‘Princess Margaret’ (bright pink), ‘Duchess of Edinburgh’ (dark pink) and ‘Sheffield’ (pale pink), notably in mail order catalogs. Fall mums are perennials and can be grown just like almost any other perennial, although they do have a few particularities worth mentioning. 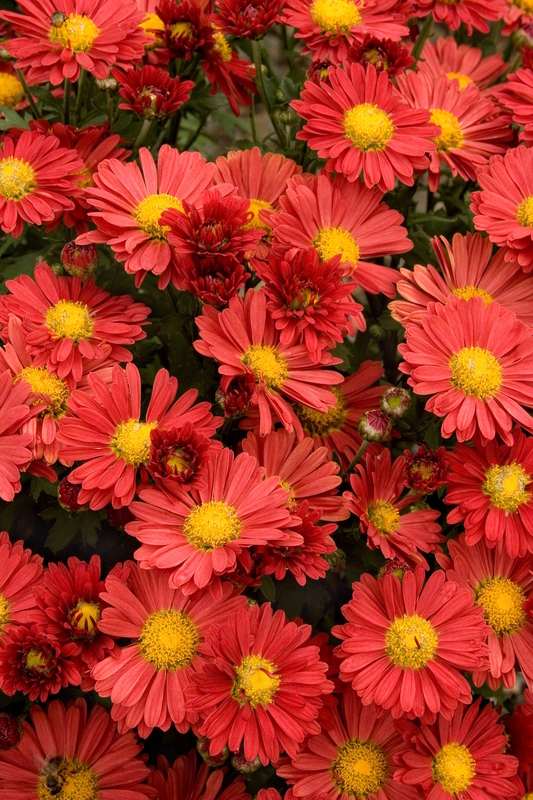 Planting: Yes, I know: garden centers are full of blooming chrysanthemums in the fall, but ideally, you should purchase and plant garden chrysanthemums in the spring. This will give them to the time to root well before flowering. If you do buy a plant in the fall in full bloom and plant it as is, it will tend put its energy in producing flowers rather than establishing a strong root system. As a result, even hardy chrysanthemums may fail to survive their first winter. Often you’ll find it lying on its side in early spring, root ball fully exposed, shoved out of the ground by frost heave. So… if you can’t resist buying a garden mum in full bloom in the fall, you have to be ruthless once you get it home and cut off all its beautiful flowers and buds. This will stimulate the plant to produce new roots once you get it into the ground and thus massively increase its chances of survival. Even so, for the first year, you should cover the plant with a good mulch of shredded leaves once the ground is frozen. 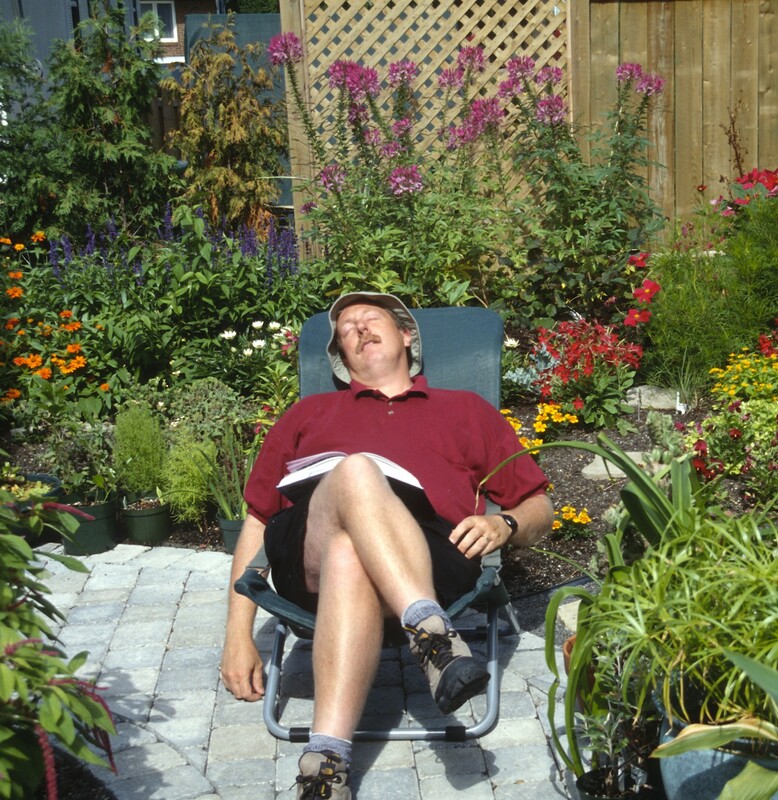 Exposure: Mums prefer full sun and become a bit thin even in light shade. Soil: Any garden soil is acceptable, but they prefer a rich, well-drained, slightly acid soil. Fertilization: Add compost or all-purpose fertilizer regularly: chrysanthemums are rather heavy feeders! Watering: Chrysanthemum have shallow root systems and won’t tolerate prolonged drought. From spring right until fall freeze-up, water thoroughly whenever the soil is dry to the touch. Multiplication: Divide in spring or take cuttings in early summer. Their seeds germinate readily, but are not true to type. Staking: Most hardy garden mums (C. x morifolium) have fairly strong stems and won’t need staking. This is in contrast to the large-flowered exhibition types usually grown in greenhouses where each stem needs to be individually staked. Hardy mums (C. x rubellum) may need staking in partial shade. Pruning: It used to be said that garden chrsyanthemums needed to be cut back by half at the end of June to produce more compact, mounded plants with stronger stems, but the varieties recommended here have strong stems and and a naturally dense habit, so no summer pruning is required. However you can prune back dead stems in spring by cutting them at the base. 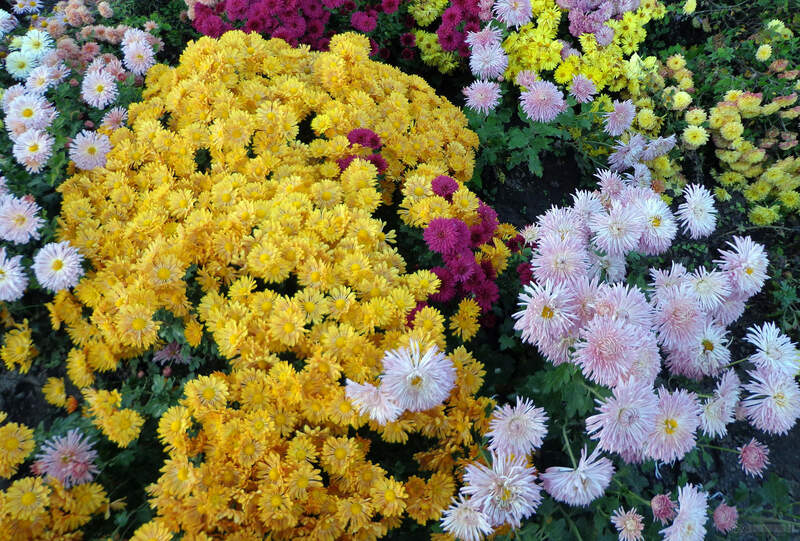 Do not cut back chrysanthemums in the fall! They need their stems to protect them from the cold of winter. People who prune their mums in the fall tend to lose them. Insects and Diseases: In general, chrysanthemum are not unduly prone to diseases and insects, but you should avoid moistening the foliage when you water to prevent foliar diseases. Chrysanthemum leafminers can trace sinuous trails in the foliage, but are not particularly harmful to the plant’s overall health. If they bother you, simply remove the infested leaves. Winter Protection: For hardy varieties, leave the stalks still standing all winter so they can catch dead leaves and snow, thus providing their own winter protection. Mums planted in the fall will however benefit from a thick protective mulch of chopped leaves for their first winter. Rejuvenation: Mums are reputedly short-lived plants, requiring frequent rejuvenation by division. While this may be true of some of the older varieties of garden mums (C. x morifolium), it doesn’t seem to apply to the hardier types. Certainly the hardy species (C. weyrichii, C. x rubellum, A. arcticum, etc.) seem to live on and on. And I have clumps of some the Mammoths that are over 10 years old. If you’re worried about this, don’t hesitate to divide them every 2 or 3 years, ideally in the spring. Where to Find Hardy Mums? 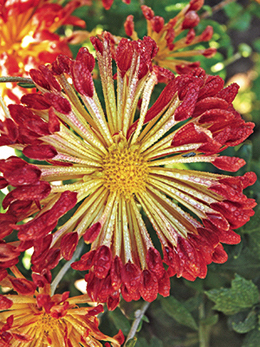 Many mail-order nurseries also offer a good choice of hardy fall mums. So, hardy garden mums do exist. It’s up to you now to find and to plant them!